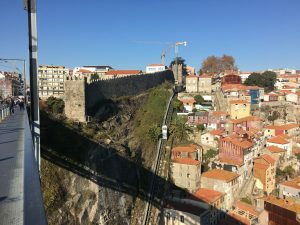 Becky December 3, 2017 December 3, 2017 No Comments on Port, Porto, Portugal! On the morning of the 17th we woke up in the aire at Esposende, looked around and decided that we would move on. Sometimes we just don’t feel enthused by somewhere and, possibly because the aire was at the back of the town behind the bus station, or possibly because we’d just got back from somewhere we’d found really inspiring, Esposende just wasn’t doing it for us. How ungrateful do we feel given that the community have provided free facilities for us motorhomers! 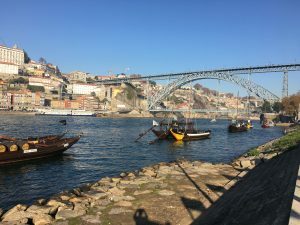 After assuaging our guilt by doing some local food shopping we moved on to our next stop – Porto, or actually a campsite outside of Porto in Canidelo. 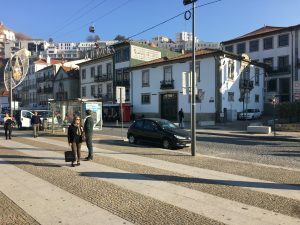 We had decided against staying at one of the motorhome parking areas in Porto due to reports of thievery, although it’s often difficult to determine what is scaremongering. Anyway the campsite gave us an opportunity to do some washing although it’s showers were lukewarm at best which was a disappointment. 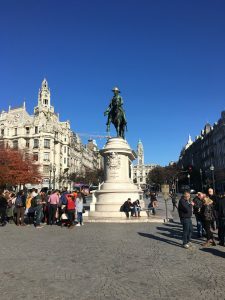 As I’ve said before, we’re not the biggest fans of cities and in Portugal we had decided that, of the two biggest cities, we would visit Porto rather than Lisbon because I’d been to Lisbon before (and loved it by the way – definitely worth visiting). Porto also gave us the opportunity to drink an alcoholic beverage we agree on – Port. Usually we have opposed tastes in drinks, Paul likes cider – I think it tastes of bile (I’m sure you can imagine the teenage activities that led to this view) – I like wine, Paul thinks it tastes of vinegar. I drink beer, Paul doesn’t. I drink gin, Paul drinks vodka. Anyway, we both agree on port, although we don’t usually drink it except at Christmas. 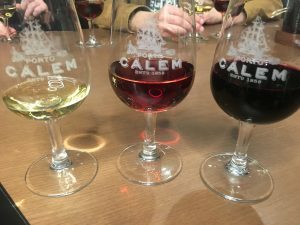 We booked ourselves into Calem – one of the many port wine cellars in Porto – to do a tasting. It was €10 to taste two ports and €15 to taste 3 different ports, so we paid €25 to taste 5 between us. We visited their small museum, which was quite interesting especially the bit where you get to try to identify different component scents of port and wine, then we were taken through a short tour of the wine cellars with some background info about the port making process before the tasting. Unfortunately they did mess up in their organisation a little, so it took some effort to actually get to taste the ports we had paid for. I think some people who hadn’t paid for the three port option just plonked themselves down in front of them and started drinking! But as our guide just disappeared and left us to it when we got to the tasting we had to hunt someone down and explain. Despite this the glasses of port were generous and slipped down our throats with sweet viscosity, leaving me feeling a little squiffy. We had booked our port tasting for mid afternoon, knowing that we might not feel like doing much afterwards. 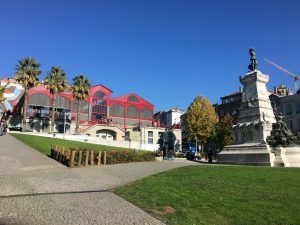 So our morning had been taken up with our bus journey into Porto and wandering around the streets looking at various historic buildings. Paul doesn’t like aimless wandering so I always try to be prepared with a few things to aim for. 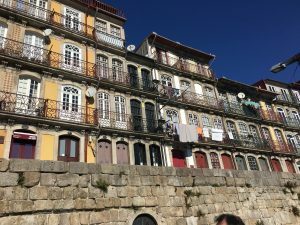 The streets of Porto had a lived in and slightly down at heel feeling, with high end shops selling designer goods cheek by jowl with shops selling cheap clothes and groceries, alongside empty buildings. 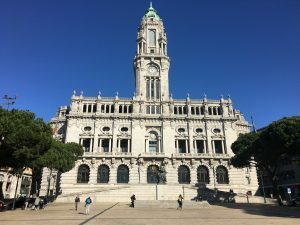 It must reflect the economics of property ownership in the capital, apparently the more wealthy citizens of Porto have moved out into the suburbs leaving the property market in the centre of the city depressed and many property owners without the incentive to renovate or restore. 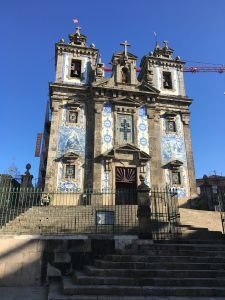 The whole of the city centre is a UNESCO world heritage site and the reason for this was particularly obvious in the wide squares flanked by historic monuments and when walking along the Ribeira – the waterfront on the Douro river with it’s attractive buildings housing (mostly) cafes and restaurants. 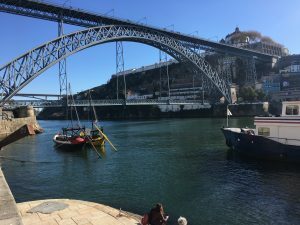 We had our lunch at a restaurant on Ribeira’s quay side, sitting in the sun, soaking up the atmosphere and watching street musicians arguing over their turf and the throngs of tourists passing by. After lunch, full of food and unwilling to walk up the steps, we caught the funicular to the top of the Ponte Dom Luis I, a bridge designed by Eiffel which has a pedestrian crossing on lower and higher levels. The lower bridge is shared with cars and buses, the higher bridge shared with trams. 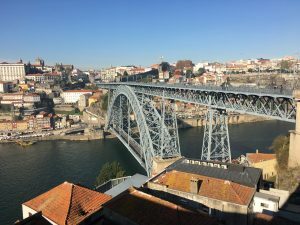 From the top of the bridge we could see the city of Porto arrayed along the steep northern bank of the river. On the south bank we could see the logos of many well known port brands, Cockburns, Sandemans and Taylors amongst others. 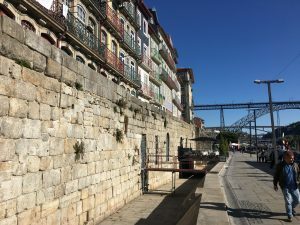 The south bank is the town (now a suburb of Porto) of Vila Nova de Gaia and after our port tasting we walked several miles along this bank of the river back to our campsite at Canidelo where the Douro meets the sea. On the way we wondered at the number of buildings which were decrepit and abandoned in what seemed like prime riverside locations, one with goats roaming in and out of the empty doorways. We got back to our campsite ready for a good night’s sleep before we moved on again.